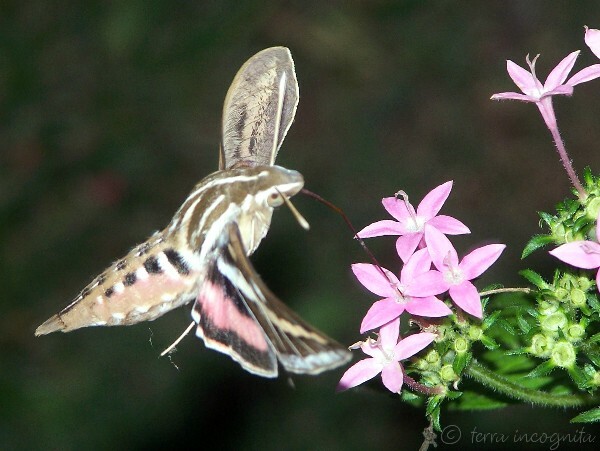 I saw a pink and striped hummingbird moth late this evening. This one was much larger than the green and reddish colored ones I saw in the yard for several evenings last month. The picture to the left is kind of blurred, but you can still see the pink color and the stripes on the body and wings. This one was very friendly, and flew and hovered all around me, even almost touching my hand a couple of times. I had on a dark pink tshirt and it seemed to be attracted to that color. I’m definitely going to plant these pink penta flowers again next year– they attract hummingbirds, tons of butterflies and honeybees, and now hummingbird moths! It was almost dark so I didn’t get a chance to take more than these two photos, and I had to use a flash to get these. Both photos are clickable for larger versions. Also, see my newest post (Sept. 2010): Striped Hummingbird Moth for much better and closer photos. I love watching these moths and have seen several this summer, but none like the one you have photographed here. it’s beautiful! I have been seeing these on other blogs. I’ve never seen one! You did great in low light. Leeann, I saw this one right at dark and even after dark. It was here today and yesterday also. 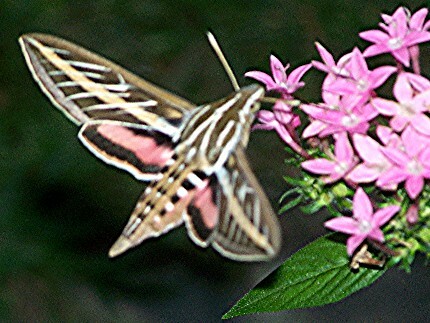 Look around your butterfly bush very late evening, you may see one of these pink colored ones. Mary, thanks. I see them quite often here, more this summer than I ever remember. I rarely see them during the day, it’s always very late evening and at night. I usually hear them before I see them — they sound just like a hummingbird in flight, and they come very close to me, closer than a hummingbird usually does. They seem to be drawn to the same types of flowers as hummingbirds. I’m almost positive that they would be in your area too (I’m not all that far from you, and our weather seems to be very similar). Hopefully you will get to see one some time, as they are very pretty and interesting to watch. I saw one at dusk yesterday and other than the antennae, would have sworn I saw a hummingbird! It was not scared and fed on a plumbago bush. I am in Fort Myers, Florida. Where else have they been sighted? There are many different types of these hummingbird or sphinx moths and I think they’re found all over the US. The first time I saw one, I thought it was a hummingbird too! I always love to see them in my yard. on February 10, 2009 at 11:37 pm | Reply Lynn B.
Hobe Sound, Florida (just north of West Palm Beach and Jupiter FL… We saw one of these today. Your photos are great, this one never stopped moving. They are beautiful and funny because ours was on a red penta … we have 4 red and 6 large pink penta plants. Thanks, Lynn B. They are almost always hard to photograph when they’re *always* moving. :) They do seem to love the pentas. Thanks for commenting. I see these moths at dusk on a hedge of miniature bottlebrush in my yard. What a beautiful creature. Yes, they truly are beautiful and fascinating, aren’t they? That’s great! They are beautiful moths aren’t they? We saw one tonight near Dallas, Tx, on our petunias. We were sure that we had just seen a new kind of hummingbird. What a beautiful sight. That’s what I thought when I first saw one too — they look just like little hummingbirds! Yes, they are a beautiful sight. We HAVE found one in our Garden in Thurleigh, near Bedford in England! We have some good pictures and are currently looking after it untill we decide what to do with it! There is a butterfly park near us and we may take it there. It’s very beautiful! Please reply with any advise, should we just let it go? I’m not sure. If it were me, I would let it go. I don’t think it will live very long if you don’t. I didn’t realize they were so rarely seen in England. Yes, they are very beautiful! Glad you got some good photos of it. Spotted in North Vancouver tonight. We’ve had exceptionally high temperatures lately; yesterday was 32C. We were in our back yard and the honeysuckle, which usually attracts hummingbirds, had this very tiny thing visit, which I assumed was a baby hummingbird. Until I saw the antennae. A hummingbird hawk moth apparently. Biggest ‘moth’ I’ve ever seen, but I guess these are just the words and categories that men like to use to describe the amazing things we find in nature. I almost always mistake them for small hummingbirds when I first see them. They are amazing! Thanks for your comments. I HAD SEEN ONE TONIGHT UP HERE IN GRAND RAPIDS MICHIGAN. WE HAVE TONS OF PERRENIALS AROUND THE HOUSE ALMOST EVERYONE YOUU CAN HAVE. LOOKED LIKE A HUMMING BIRD TILL HE STARTED FLYING ALL OVER. Just saw one in my pink petunias (Columbus OH). Could not imagine what it was, but your photo is perfect! The cat jumping against the patio door alerted me. I think, judging from kitty, he’s visited me before. Glad my blurry photo helped identify it. :) The night-flying hummingbird moths are so hard to get a good photo of. lol, yes they would definitely get a cat’s attention! hey i saw one at my friends house and it landed on my arm is that normal? Hi Kendall, yes, sometimes they are very friendly, especially these striped ones that fly at dusk. They are cool, I love to see them too. How neat that you got one to walk on your hand. Do you have a blog? Those pics would make a great post. I was out weeding my tall pink phlox garden late this afternoon & I have seen a humminbird occassionally out there, but they are very shy. They also make a sound like a motor so I always know they’re there. But tonight I saw one of these little guys & he really confused me. I thought for sure he was a baby hummer, but he made no noise, but his little wings were going so fast. He was just beautiful. He was also friendly and started for my arm, but startled me and I backed up. He spent about 10 minutes on my pink phlox, then I had to come in and look him up. I’m glad I found him on this site. But he’s much too beautiful to be called a moth!!! I’ll have to keep my camera ready & be ready to let him land on me next time. They surely do love the color pink! They do seem so friendly. Thanks for commenting. To my delight and long awaited visit I have seen this striped hummingbird moth at night and couldn’t tell what color it is, but it is this one, I’m pretty sure. It is awesome to have it in our neighborhood in Columbus Ohio. I thought about getting the caterpillars and raise them next spring, so we will have more to our area. There are a couple of sites that sell the caterpillars. I would definately let them go and not keep it. It likes my moon flower and the pink and white cleome and I heard they like evening primrose, too!!! Happy hummingbird sightings!!! Good luck if you do decide to try and raise them. I saw one of these for the first time last night while watering my petunias just at dark and also thought it was a hummingbird–but very rare looking with all the stripes. Very interesting…didn’t know we had such things like that way up in Warroad Minnesota. The first time I saw one, I also thought it was a hummingbird, flying at night! They surely are interesting. Well, to our surprise we just discovered these wonderful moths about a week ago on our spider plants. My son went to move a sprinkler and noticed them. We took cameras out last night (7/6/11) and got a lot of pictures. The ones we saw were muted beige, and the body was almost black and yellow/orange striped. We live in southeastern Pennsylvania, about 40 minutes from Philadelphia. P.S. I just learned that the ones flying around in our yard are ‘hawkmoths.’ They looked like the ones we saw last night because of their coloring…. Spotted a pink stripped hummingbird moth 10:00AM at 8200′ in Buena Vista, Colorado September 6, 2011……. Glad you got to see one! I think the pink striped ones are the prettiest. Yep, just saw one walking my dog this morning at 10 AM in Colorado Springs! Thanks for the blog, now I know what the crazy little thing is! You’re welcome Roy, glad you found it helpful, and that you got to see one of these amazing creatures. I believe I had one of these at my flowers the other evening in Central Alberta, Canada. It was beautiful and i was tuly amazed watching it. i tried to get pictures but it would fly off each time. i had never seen or heard of these until now. Are they known to be in Canada? Donna and I just saw this Moth Hummingbird in my backyard!!!!!!! They’re awesome aren’t they? :) Glad you got to see one! Just saw 5 for the first time tonight!! Found this blog while searching what we found. So friendly and love pink! Hope they stick around! Iowa. Wow, 5 at a time! Would love to see that many at once here. HI Juliann, how luck to get to see that many at once! Glad the post helped you identify. Saw one just before dark at a backyard wedding reception up here in Winnipeg. Hung around for a few minutes and didn’t seem botherd by all of the activity. I have pictures on one that was flying around my pink petunias on September 16, 2012. I had seen a pair a couple months ago, but couldn’t get my camera to catch up with them. I live in Northeast Montana. anonymous, I never seem to have my camera ready when I see them, ;). I’ve been seeing them a lot lately, usually in late evening, also around my petunias and other annual flowers. Grace, glad you got to see one, they do seem friendly! Saw several pink w/stripes today. Thought it was a baby hummingbird until I saw the antennae. Husband and I have NEVER seen these before. Pretty little thing. I just saw one here in Lansing, Michigan at dusk. It was feeding on my Hostas. Like everyone else, I at first thought it was a Hummingbird. Very cool! / Where are you located? I live in the thumb of Michigan 1/2 mile off the lake. This is the first time I have ever seen them. They seem to like my Hostas. My neighbor thought I was in wonderland when I tried to describe it to her. She just called to tell me she also seen one in her Hostas. I have had these planted for about 15 years so I know its nothing new that would attract them. So anyway I googled and found your sight. Dear Anonymous, I also live in the thumb of Michigan! I have just seen my first hummingbird moth tonight and am delighted. We have lived here since 1988 and never seen one before!! Mine was down in the middle of my lily plant debri, that I was pulling out and deadheading! I do have pink phlox near it however. We are not that close to the lake. Lapeer County. thanks for your post. We saw one this morning on our fern in the backyard. It’s 60 degrees in Elk Grove, IL. It was getting out of the rain.. I was able to pull its wings open to reveal the pink spotted lower wings. Huge body compared to other species. Thanks for setting up this sight. Very cool that these are so many places as well as in Europe. My garden is in Southern Alberta. I found a few of these moths mid Sept. I saw one in my garden for the first time this evening at about 7:30. He was way down in my lily plant in the dirt! I hope if you click below you can see my pic. And I forgot to mention, I am from Michigan. Yes, I can see your photo, great shot! Thanks for sharing it. Was watering my dark pink wave petunias and spotted this moth. It flitted from blossom to blossom as I studied it so I could try to identify it! I had never seen one like it before! We commonly see ruby-throated hummingbirds here in West Michigan so I thought it was some other variety of hummingbird. Glad I found the picture on your sight that identified it as a striped hummingbird moth! I love it when I see one of God’s beautiful creatures for the first time! The unlimited variety of species and their beauty convince me that He is our Creator, and I give Him all glory! It is mid September in NE Indiana and I’ve seen this moth for the last couple of weeks on my pink impatience and other flowers…I’m so glad that you posted the picture so I could identify it. We have seen this moth now for over a week in our yard in Jay county In. (2013). First time ever in decades of gardening. Thanks to everyone for continuing to share your sightings, keep them coming! con son, that was a beautiful picture! Just saw 2 in at my flowerbeds…Midwest City, OK Thought they were a hummingbird as well so I had to google them! Thanks!! after reading your post and seeing your picture I have seen the hummingbird moth during daytime in our Guildwood garden, but didn’t know what I saw. Thanks for helping me solve the mystery: it looked like the love-child of a humming bird and a moth. Spotted in Guerneville, CA. Denver, CO – I too swore it was some type of hummingbird. Even got in to a disagreement over whether it was a hummingbird or a moth. Saw one last night and three tonight. They were poking around pink flowers like in your pics, and yes, they’ll let you get quite close, but I have no photos. Saw one for the very first time tonight in Little Tokyo, Downtown, Los Angeles. We did not know what it was … and found this photo! So glad you took these photos to help us figure out what it was! Thank you! It was pretty increcible to see! It fluttered in the flowers near a musician playing in an open courtyard. It seemed very friendly … in fact it got about only a few inches away from our little girl’s face. After a few moments the creature had a bigger audience than the musician! Hope to see one again! I photographed one of these, but was surprised it is a hummingbird since it doesn’t have a long beak, just a long tongue. I have posted it on my FB page. I saw one for the first time tonight in Pflugerville, TX, (metro Austin). It was flitting around my yellow and white lantanas. I thought it was a hummingbird until I looked it up and found this post. Your photo looks exactly like what I saw. I did get photos with my phone. It did giant loop-de-loops around me and the flower bed. I had one in my flowers last night (aug 17 2014) in Parksville British Columbia on Vancouver Island Canada.Was fortunate enough to get a picture. Calgary Alberta. Took a picture of one on the petunia plant early evening Sept.18/2014. Beautiful to watch. I saw one yesterday and it was just fascinating. And yes, not scared of my approach. Thanks, i was trying to identify it.